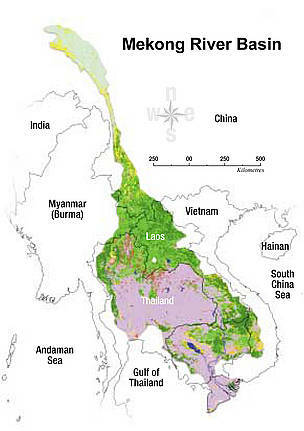 Sediment flows create the very landscapes around the Mekong, shaping and maintaining the riverbed and the floodplains. The river acts as a natural conveyor belt, carrying sediment from the uplands – the largest share originating from China and Laos – to natural sinks in Cambodia’s Tonle Sap lake and Vietnam’s Mekong delta, where they replenish the land and soil. These fertile floodplains are prime agricultural and fisheries areas, critical to regional food production. Rapid economic development is disrupting these sediment flows, with cascading negative impacts on ecosystems, livelihoods, and ironically, the economy. Previously, the upper reaches of the Mekong generated more than 60% of the river’s sediment load, but hydropower development to feed China’s economic growth has trapped the majority of the sediment behind dams. Ambitious plans for hydropower development on the lower Mekong threatens to further break up sediment flows. Increasing demand for sand – the key ingredient in concrete – to support the region’s construction boom is further depleting the natural sediment conveyor belt. WWF estimated 50 million tonnes of sand were extracted from the Lower Mekong mainstream in 2011 alone, much more than the river produces in a year. These drastic disruptions of the sediment regime are already reshaping landscapes downstream. Vietnam is the first to feel the effects. Between 1998 and 2008, the river bed in the delta’s two main channels fell more than one metre, allowing salt water to penetrate further upstream into fertile rice paddies. Coastal erosion is also increasing: on average of 12 metres of land is lost along the coast of the delta each year. Though more difficult to measure, the entire delta is also subsiding. Simply put, Vietnam cannot lose the delta. Often called Vietnam’s “rice bowl,” the delta produces 50% of the country’s staple food crops and 90% of its rice exports. It is one of the most productive and densely populated areas of Vietnam, home to 17 million people and contributing as much as 27% of the country’s GDP. When sea level rise caused by climate change is added to the mix, Vietnam has only a short time to prevent a possible disaster. Hoping to improve transboundary cooperation around this issue, the Vietnamese government ratified the UN Watercourses Convention (UNWC) in 2014. How can the UNWC benefit the Mekong region, when the Mekong River Commission, created by the 1995 Mekong Agreement, already regulates international cooperation between its member countries, Cambodia, Laos, Thailand and Vietnam. The answer lies in sediment. Take Phnom Penh. The Cambodian capital is situated in the Chaktomuk junction, where the Tonle Sap, Mekong and Basac rivers meet, and it both benefits from and is vulnerable to the rivers. Cambodia’s population and economic hub is booming, and sand mining to fuel the city’s growth is also endangering it. Over-extraction is causing the water table to fall, threatening agriculture, fisheries, and even security as the destabilised riverbanks cause damage to buildings and roads. What might seem to be a Cambodian problem actually has part of its source upstream, and its repercussions will be felt downriver. These sediment issues compound as they move downstream; as sediment is trapped by upstream dams, then sand extraction in one downstream country becomes over-extraction in the next, until there is a sediment deficit in the delta. What once appeared to be a limitless resource is now clearly becoming scarce: the sediment load in the Mekong has decreased from 160 million tonnes (mt) in 1990 to just 75 mt in 2014. Even upstream countries like Laos and Thailand are already facing increasing river bank erosion, the usual first signs of sediment reduction. All riparian countries should be concerned. Instituting basin-wide, transboundary sediment management comes with big challenges, but even bigger benefits. The technicalities of how to manage sediment – how to decide sediment quotas? How to monitor them? – are complex, but these technical solutions are easier to implement than institutional ones. The real challenge is creating equitable transboundary cooperation, guided by the principles of international water law. The expected benefits are well worth the work. Effective sediment management will sustain economic growth, not just in the construction and energy sectors, but also agriculture and fisheries. It fosters human well-being, helping maintain food security and access to water by keeping groundwater attainable. It is critical to environmental sustainability; this process is key to the ecological integrity of the entire river system. Finally, swift action on sediment is important for political stability, by avoiding regional conflict. The current regional institutions were not created to deal with these problems. The 1995 Mekong Agreement was created to address water abstraction and salinity intrusion, and in the years since, the MRC has focused on managing water flows and transboundary fish migration. Many of these conflicts revolve around hydropower dams. The Mekong is the world’s most productive inland fishery, and with over 150 species of long-distance migratory fish, keeping the river open for fish migration is critical to food security. Large-scale dams on the mainstream endanger these fisheries, but the MRC has struggled to mediate between countries developing hydropower and neighbours’ food security concerns. Still, there is increasing realisation, especially from downstream countries, that sediment management is also crucial to the region’s well-being and requires more attention. The UNWC provides a ready-made framework for improving international cooperation along the Mekong. The challenges facing sustainable development on the river have changed since the Mekong Agreement was written 21 years ago, and it was not crafted to deal with the major issues of today. Vague wording in key areas has encouraged conflicting interpretations, notably in the procedure for Notification, Prior Consultation and Agreement (PNPCA) around hydropower dams and their downstream impacts. The UNWC would not replace the MRC, but clarify and strengthen it by holding it to international water law standards for equitable management of transboundary rivers. It is time for all Mekong countries to ratify the treaty and build a sustainable, prosperous future for all along the Mekong – but everyone will need to work together and reach outside their respective borders and comfort zones.